Novel printing technique: a permanent, dishwasher- proof connection is created between the glass and the transponder. A smart refinement that can be elegantly and flexibly combined with existing brand decorations. The idea is as follows: The beer is dispensed through a hole in the base of the cup, which is sealed by a magnet. Sounds cool, doesn´t it? As a Bottoms Up exclusive partner and, having developed a specially tailored glass type, RASTAL is now finding brand new ways to use this innovative dispensing system. Tradition-steeped company meets innovation factory. For almost a century, we’ve been consistently in search of the next big inspiring idea. Our invention of signature glass design more than 60 years ago opened a whole new range of branding opportunities and revolutionised an entire sector. We continue to aspire to this same standard today with RASTAL Smartglass®, once again entirely repositioning the glass as a product – an innovative response to the digitalised world of brands and consumers. RASTAL were awarded the prize in the »Retail & Trade Solutions« division of the competition category »Excellence in Business to Business (B2B)« for its smart drinking glass. The German Innovation Award was initiated by the German Design Council and is awarded not simply to products that are new but to innovations that display a demonstrable added value for the user. Your best digital media asset. 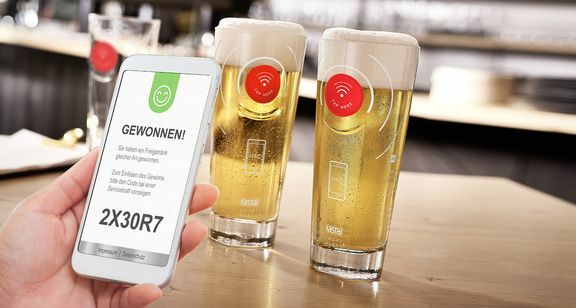 The innovative, sustainable and interactive combination of drinking glasses and transponder connects your brand directly to the consumer via their smartphone. Every smart drinking glass has a unique worldwide identity. Without any app installation, it communicates and interacts with every NFC-enabled and device. Augmented Reality integrates digital content of all kinds, such as videos, images and virtual objects, in the real world. This allows interactive scenarios to be created on the display of your smartphone or tablet in real-time. Just imagine seeing an image video directly on your product! Craft Beer is the new passion for beer. With valuable inspirations for the national and international brewing landscape. And like a good craft beer, our design lives from this passion, too. With a great deal of love for the product, and for an idea that makes the difference.